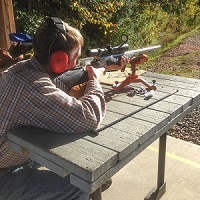 The Vermont Fish & Wildlife Department says its Walter Cabell Shooting Range in Woodbury, Vermont, will be open for hunters to sight in their rifles on Saturday and Sunday, October 27 and 28. Shooters will be required to follow all range rules, including limited hours of operation. A range safety officer will be on site to assist users and ensure rules are adhered to. The range will be open from 10 a.m. to 3 p.m. The Walter Cabell Shooting Range was developed by Fish & Wildlife at the Buck Lake Green Mountain Conservation Camp. Every year approximately 500 students attend summer camp here and use the facility to obtain their hunter education certificates. The range provides a safe, accessible and environmentally friendly shooting opportunity for campers. This range is located at 1081 Buck Lake Road in Woodbury, Vermont, and it includes several lanes and benches with an overhead shelter, side berms, a backstop and a small parking area. Target backstops are at 15, 25, and 50 yards. More information about the range can be found on Fish & Wildlife’s website www.vtfishandwildlife.com.